Indigenous protesters in the Bolivian Amazon have broken through a police blockade to continue a long-distance march on the main city, La Paz. The protesters forced their way through police lines by taking the Foreign Minister, David Choquehuanca, hostage, officials said. Mr Choquehuanca - who had come to negotiate with the protesters - has since been released. The marchers oppose plans to build a road through a rainforest reserve. Bolivian officials said Mr Choquehuanca was used as a "human shield" by the protesters, along with another government minister and a police commander. "I was preparing for talks when women surrounded me and then there were problems. There were some who were angry and they forced me to walk," Mr Choquehuanca told the Spanish news agency Efe after his release. "The fact that they decided to free me is a sign that they want to resolve matters through dialogue," he added. Riot police had been blocking the march for several days to prevent clashes with communities along the route who support the road project. 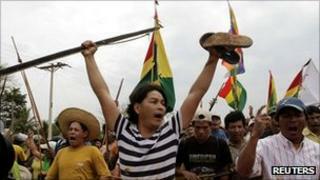 Indigenous protesters waving flags and brandishing traditional bows and arrows surged through the lines of riot police. One officer was wounded, apparently by an arrow which struck his face. The marchers were advancing on the town of Yucumo, which is populated by migrants from highland Bolivia who have promised to halt their progress. The dispute over government plans to build a road through the Isiboro-Secure Indigenous Territory and National Park - known by its Spanish acronym TIPNIS - has sharply divided opinion in Bolivia. The indigenous tribes that live in the reserve say the road would encourage illegal settlement and deforestation in their ancestral Amazon homeland. But President Evo Morales says the road is vital for national integration and development. He has also promised strict environmental safeguards. Hundreds of protesters set off in August on the 500km (310 miles) march from the Amazon town of Trinidad to La Paz, the seat of Bolivia's government in the high Andes. But last week they were stopped outside Yucumo by police who said they wanted to prevent possible clashes with supporters of President Morales. The marchers said they had been blocked for political reasons, and were being denied access to food and water. The protest is an embarrassment for President Morales, who is a prominent advocate of indigenous rights. The road project has alienated some of the social movements who helped him become Bolivia's first indigenous president, provoking demonstrations across Bolivia. The highway linking the highland city of Cochabamba with San Ignacio de Moxos in the Amazon lowlands is being funded by Brazil and built by a Brazilian company.